Forest Hill Society: One Way for the Future of Perry Vale? For a number of years the Forest Hill Society has been looking for ways to improve the area to the east of Forest Hill station. In particular we have been looking at a small stretch of Perry Vale — between the South Circular and Waldram Crescent — where there are a small number of shops. We think this area could be revitalised and become a new destination in Forest Hill. We have recently seen Waters’ fishmonger and greengrocer open, and Clapton Beers are planning to open a new craft beer shop later this year. But this road has much more potential. It is the only shopping street in the centre of Forest Hill which is not on a bus route, and we think this provides an opportunity to make it better. Taking our inspiration from Catford Broadway and Lambs Conduit Street in Holborn, we have put together a proposal for this stretch of road to become one way, allowing more space for pedestrians and cyclists, as well as some parking and dedicated loading bays. By widening the pavements it would not only improve the area for pedestrians, but it could allow for some of the cafes to have tables outside. This scheme was discussed at the Forest Hill Society AGM and at a recent Perry Vale Ward Assembly. We have also encouraged people to respond to our consultation, for which the results were overwhelmingly positive (although some useful feedback was received from a number of respondents). Perry Vale councillors are now working with Lewisham Council’s transport team to look at putting together a bid for funding from TfL to further develop the scheme and implement the necessary changes to the road layout. This is not really a new idea, but the Forest Hill Society has turned an aspiration into a realistic plan, which can now be pursued further by Lewisham Council. 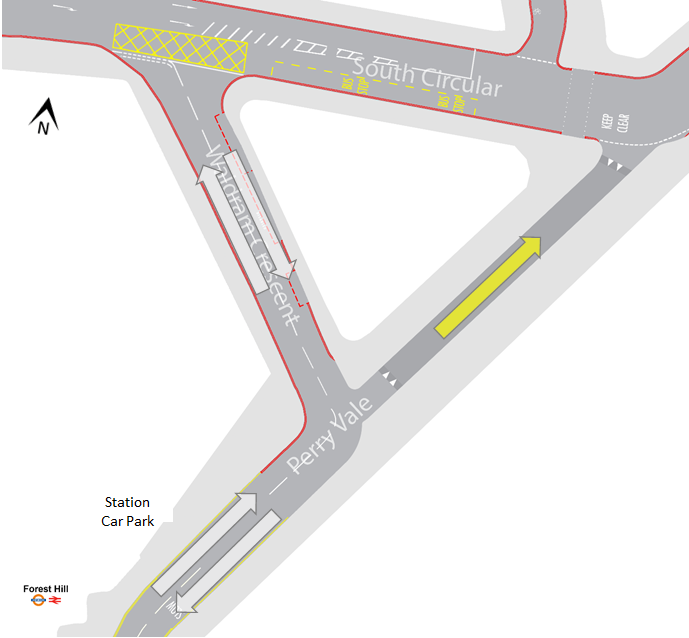 Following the 20mph scheme now instituted across Lewisham, the Council are taking another look at the possibility of a pedestrian crossing close to the station — on the Perry Vale side, which would make a big difference to many pedestrians. Clapton Craft is great and they have seen a huge amount of traffic. Shame Waters still looks so shabby from outside. You came really even tell it's open. I have never know a retailer particularly an independent to have their door closed when they are trading. It just doesn't look inviting.